Demand for quality world flavours is growing. 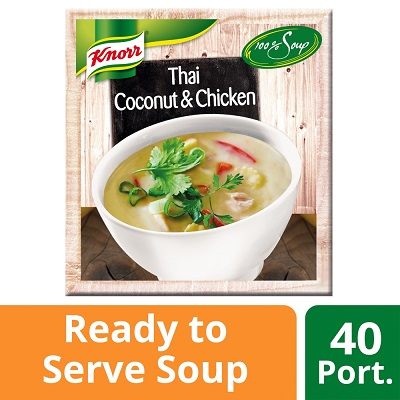 Delight your customers with new Asian style Knorr 100% Soups. Add easy and quick inspiration to your menu. Water, coconut (7.8%), vegetables (red bell pepper, sweetcorn), water chestnuts (3.5%), chicken (3%), modified corn starch, SOY sauce (sugar, water, SOY sauce (contains SOYBEAN protein), salt, rice vinegar, corn starch), rapeseed oil, sweet BUTTERMILK powder, ginger puree, salt, sugar, herbs ( lemongrass, Kaffir lime leaves), yeast extract, garlic, flavourings, onion powder, lime juice concentrate, stabilisers (triphosphates, polyphosphate), SHRIMP powder. A ready prepared medium spiced Thai style coconut chicken soup, with lime and water chestnuts. ON THE HOB: Open the pouch. Pour contents into the pan, heat product to a minimum temperature of 75°C. Stir from time to time. COMBI-STEAMER OVEN: Pre-heat the combi-steamer oven to 95°C, 100% steam. Place the unopened pouch in a perforated tray suitable for use in the combi-steamer oven. Heat for 30 minutes at max. 95°C, 100% steam. Remove immediately from combi-steamer oven, open & transfer contents to serving unit. Ensure that the temperature of the contents is > 75°C. WATER BATH: Place the unopened pouch into a water bath (95°C). Heat through for 30 minutes. Remove from water bath, open & transfer product to serving unit. Ensure that the temperature of the product is > 75°C. HOLDING THE PRODUCT IN A BAIN MARIE: Product should be held at or above 70°C for a maximum of 4 hours & stirred frequently to ensure even heat distribution. Prepare only the amount needed for one service period & do not add fresh product to older batches. Store in a cool dry place. Once opened refrigerate any unused product and keep for max. 72 hours at max. 7°C. If pouches remain unopened after heating, they can be cooled down to < 10°C (following HACCP rules) and reheated to above > 75°C for use within 24 hours.